Just because I like to keep things interesting, I thought I'd introduce something new to Southern In Law - a Style series. These are just going to be fashion tidbits every now and again for something fun and different. Let's be honest here, I'm a bargain queen. I buy clothes on sale and I'm not afraid to say I buy clothes from Kmart from time to time. Why? Because I don't care where my clothes come from, as long as I like them. Having Jesse live so far away means our money goes towards plane tickets or saving for things we'll need in the future, rather than luxury items. This is why I decided to start posting fashion tidbits on Southern In Law - because I know I'm not the only one whose wallet goes running for the hills the second they click onto a fashion blog. Sure, I have a few luxury items, but they've been chosen for specific reasons - like a staple skirt that I'll wear for years or my real pearl jewelry pieces, bought simply because that's what I love. Fashion shouldn't be about the price tag or what designer's name is plastered all over the place. It should be about what you love and what suits you, your personality, and your figure. In stores at the moment, you can find lots of printed denim. Floral prints, geometric prints, swirls, animal prints - you name it. But how do you pull them off without looking like some kind of walking billboard or drawing attention to the wrong areas? To put it simply - how can a normal person wear a printed jean? Above is how I would wear printed jeans. I think the best thing to remember with printed jeans is not to introduce any other patterns - you want to look for plain, solid coloured accompaniments (in this case a top and blazer) so that it doesn't become any busier than it already is. So tell me, have you tried the printed jeans look? I don't have the legs to pull these pants off, but my skinny friends with great legs pull them off so well. Agreed, keep everything else simple but the jeans! Nice except the top is wrong! Very true :) I'd like the top with plain jeans! I want it! I'm on the lookout because I love tiered/layered tops like that! Colours always make me feel brighter and happier (forgive me if that sounds weird haha) so I love the top right pair! Hi there! What is your opinion on commercials placed on blogging websites? HiKaren, I think it's fine as long as the advertisements are relavent to the readers - and of course that it isn't the sole focus of the blog. to see the web page, thаt's what this web page is providing. I leave a comment when I appreciate a article on a blog or I have something to valuable to contribute to the discussion. I read. 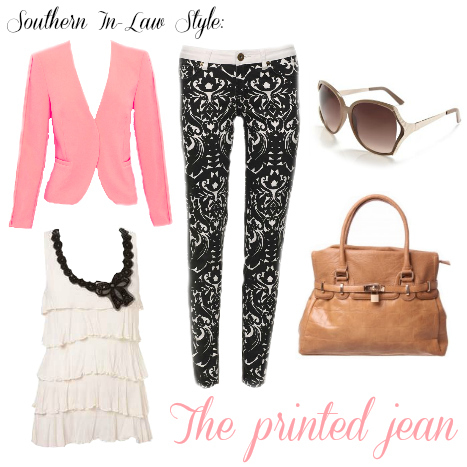 And on this post "Southern In Law Style: How to Wear Printed Jeans". I was actually moved enough to drop a thought :-) I do have some questions for you if it's allright. Is it simply me or do some of these comments come across like they are written by brain dead folks? :-P And, if you are writing on other sites, I would like to keep up with everything new you have to post. Could you make a list every one of your community pages like your Facebook page, twitter feed, or linkedin profile?